Global Warming: The Real Science Should we join the mantra or be responsible scientists? Global Warming: The Real ScienceShould we join the mantra or be responsible scientists? A. 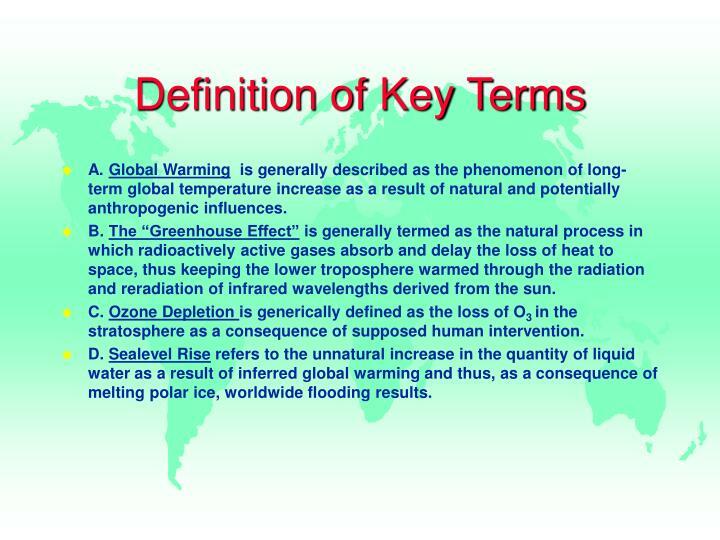 Global Warming is generally described as the phenomenon of long-term global temperature increase as a result of natural and potentially anthropogenic influences. B. 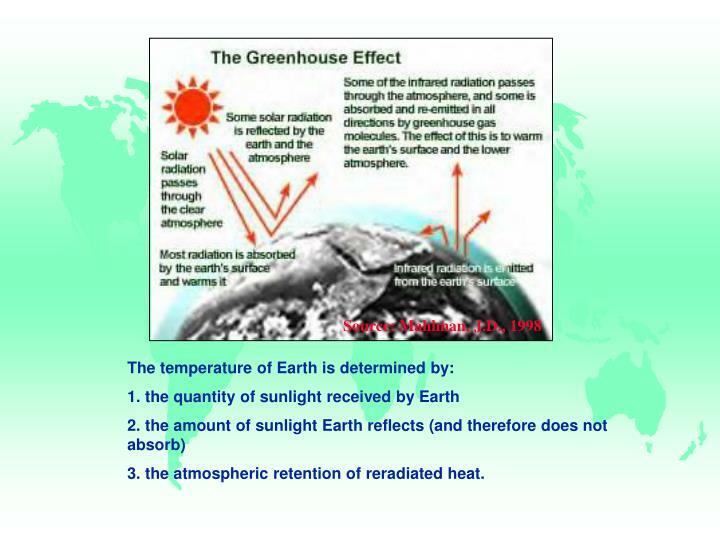 The “Greenhouse Effect” is generally termed as the natural process in which radioactively active gases absorb and delay the loss of heat to space, thus keeping the lower troposphere warmed through the radiation and reradiation of infrared wavelengths derived from the sun. C. Ozone Depletion is generically defined as the loss of O3 in the stratosphere as a consequence of supposed human intervention. D. Sealevel Rise refers to the unnatural increase in the quantity of liquid water as a result of inferred global warming and thus, as a consequence of melting polar ice, worldwide flooding results. 3. the atmospheric retention of reradiated heat. It is important to note that the “Greenhouse Effect” is a natural process that has been occurring for millions of years and were it not for this phenomenon, Earth would be considerably cooler (estimates range on the average of 25 to 33 degrees C cooler). Thus, all surface water would be frozen or on the cusp of freezing. Global temperature fluctuations (both increases and decreases) are imminent and a natural occurrence of a dynamic planet. 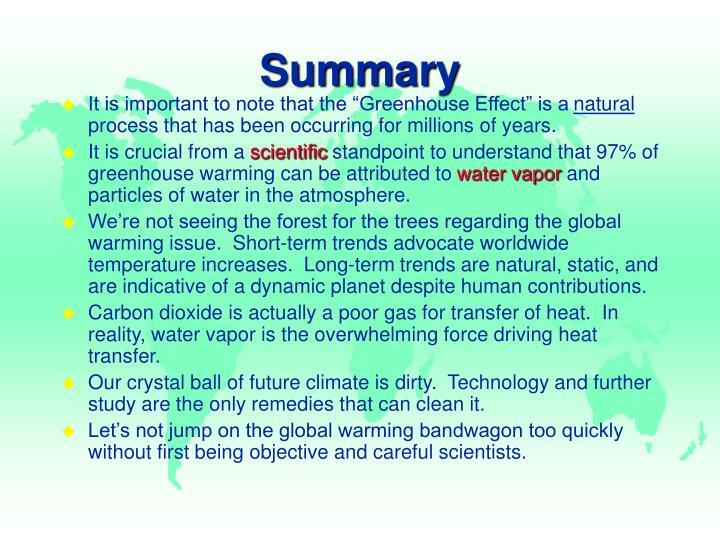 It is crucial from a scientific standpoint to understand that 97% of greenhouse warming can be attributed to water vaporand particles of water in the atmosphere. Only 3% can be attributed to “Greenhouse” gases: including carbon dioxide (CO2), methane (CH4), nitrous oxides (NOx), and chlorofluorocarbons (CFCs), a statistic not usually advertised, especially in political circles. In essence, if 97% of warming is caused by water vapor, which we can do little to affect, is 3% other gases a significant contribution to warming? Source: Michaels, P. J., 2000. So what do we (the scientific community) know for sure and what is uncertain? We know that carbon dioxide levels have increased globally over the past century. Global temperature measurements have shown an increase of approximately 0.5o C since the Industrial Revolution when the “start” of Greenhouse gases began. Unless we had a disposable replica Earth that we could add gases to and experiment with, models will have to do. Current technologies (i.e., Existing Global Circulation Models (GCMs) and climate models) are imperfect and cannot accurately discriminate between anthropogenic and natural climate variability at this time. “Greenhouse” theory suggests that any increase in gases should increase global temperature. Modern climate change does not reflect this. 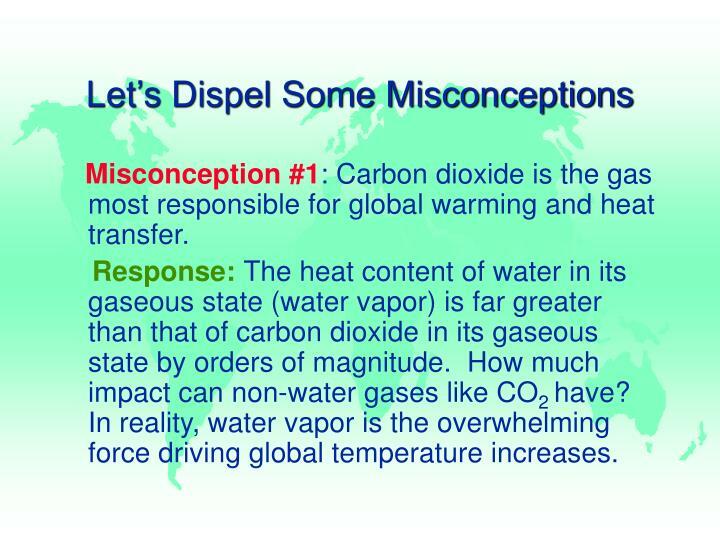 Misconception #1: Carbon dioxide is the gas most responsible for global warming and heat transfer. 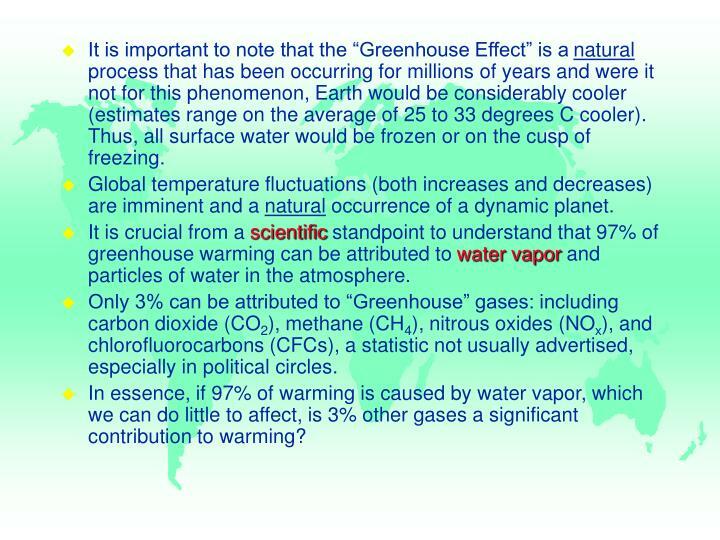 Response: The heat content of water in its gaseous state (water vapor) is far greater than that of carbon dioxide in its gaseous state by orders of magnitude. How much impact can non-water gases like CO2 have? In reality, water vapor is the overwhelming force driving global temperature increases. 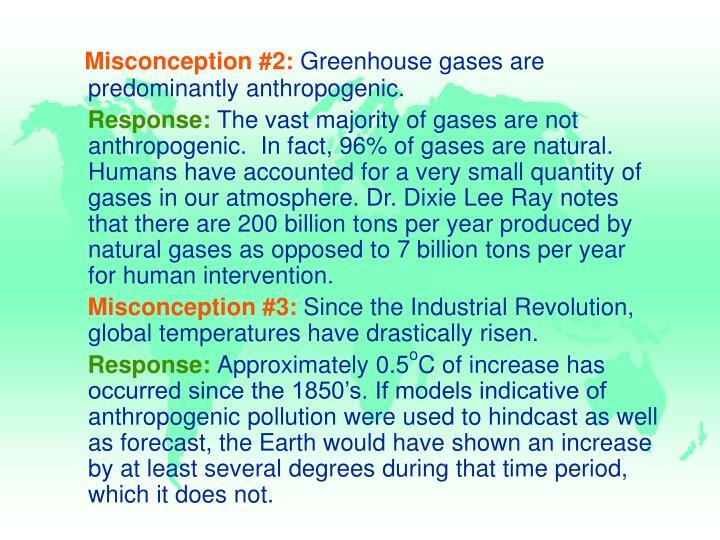 Misconception #2: Greenhouse gases are predominantly anthropogenic. 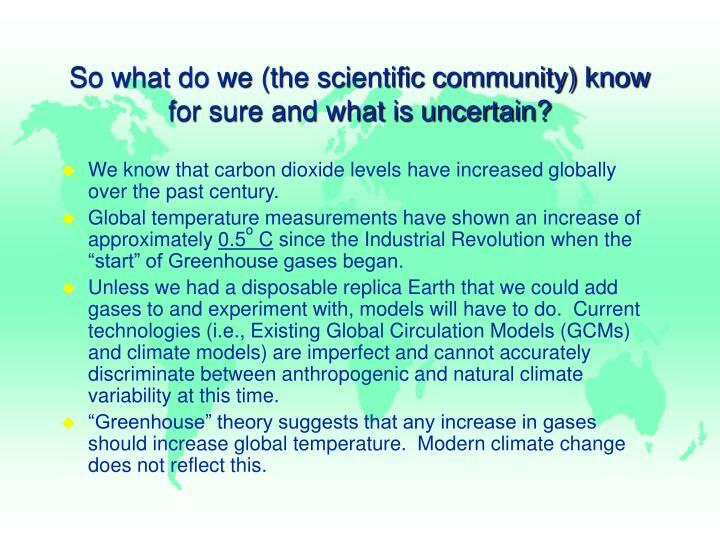 Response: The vast majority of gases are not anthropogenic. In fact, 96% of gases are natural. Humans have accounted for a very small quantity of gases in our atmosphere. Dr. Dixie Lee Ray notes that there are 200 billion tons per year produced by natural gases as opposed to 7 billion tons per year for human intervention. Misconception #3: Since the Industrial Revolution, global temperatures have drastically risen. Response: Approximately 0.5oC of increase has occurred since the 1850’s. If models indicative of anthropogenic pollution were used to hindcast as well as forecast, the Earth would have shown an increase by at least several degrees during that time period, which it does not. 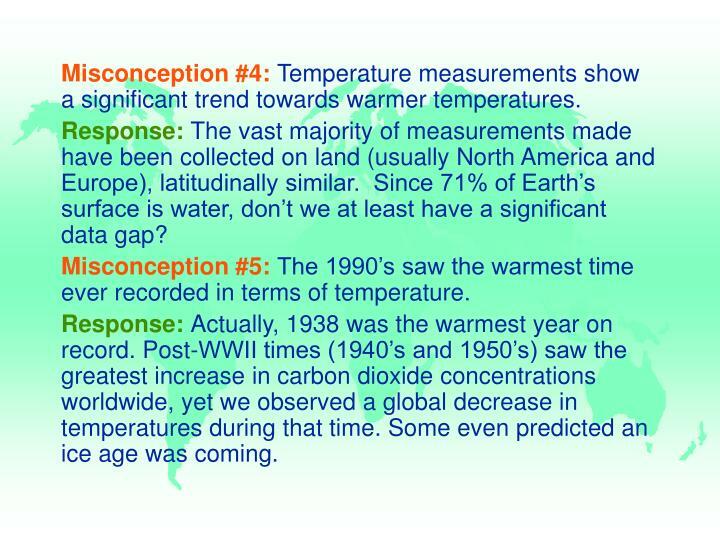 Misconception #4: Temperature measurements show a significant trend towards warmer temperatures. Response: The vast majority of measurements made have been collected on land (usually North America and Europe), latitudinally similar. Since 71% of Earth’s surface is water, don’t we at least have a significant data gap? 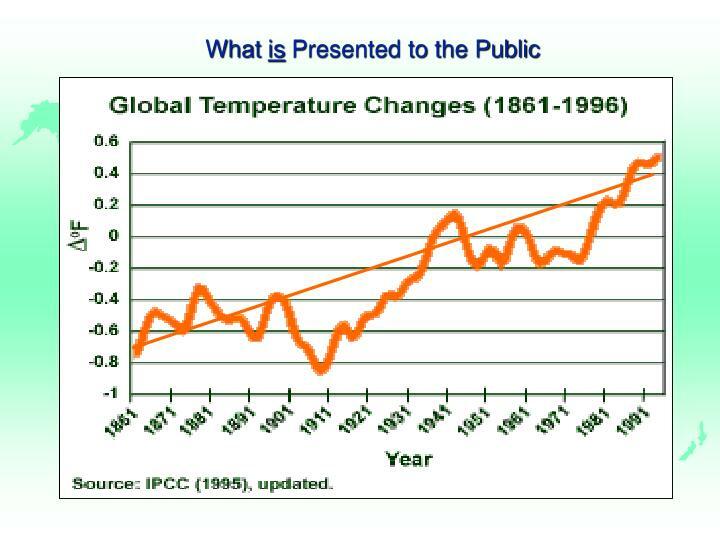 Misconception #5: The 1990’s saw the warmest time ever recorded in terms of temperature. Response: Actually, 1938 was the warmest year on record. Post-WWII times (1940’s and 1950’s) saw the greatest increase in carbon dioxide concentrations worldwide, yet we observed a global decrease in temperatures during that time. Some even predicted an ice age was coming. Misconception #6: Hundreds of years ago saw warmer global temperatures. Response: An interesting fact is that Greenland when settled by Vikings, was actually named for its appearance. Today, it hardly lives up to its name. Just a simple fact. 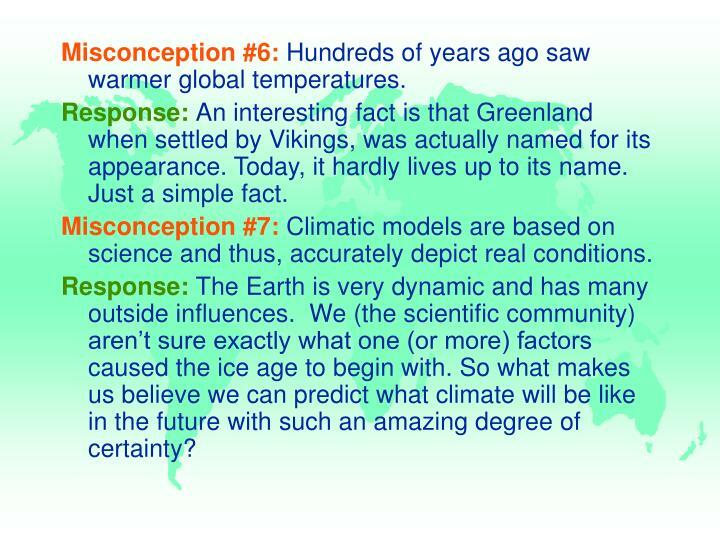 Misconception #7: Climatic models are based on science and thus, accurately depict real conditions. Response: The Earth is very dynamic and has many outside influences. 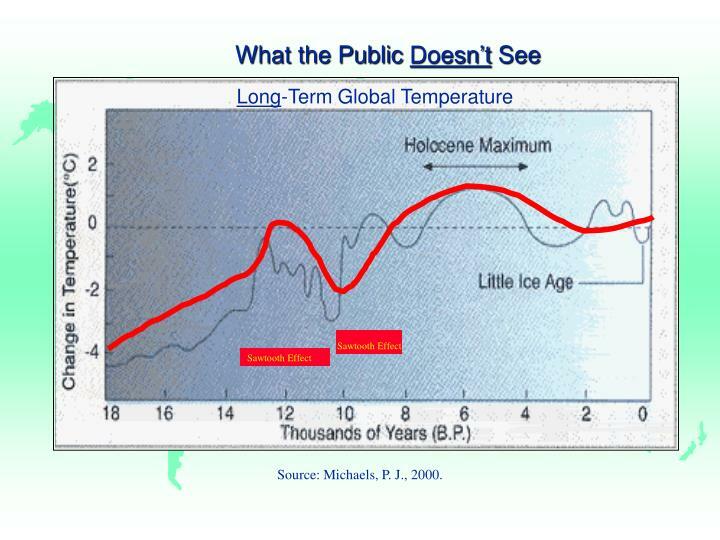 We (the scientific community) aren’t sure exactly what one (or more) factors caused the ice age to begin with. So what makes us believe we can predict what climate will be like in the future with such an amazing degree of certainty? A full analysis of the Earth’s carbon budget has not been compiled. Climate tends to change abruptly - most frequently by abrupt warming followed by slow cooling. 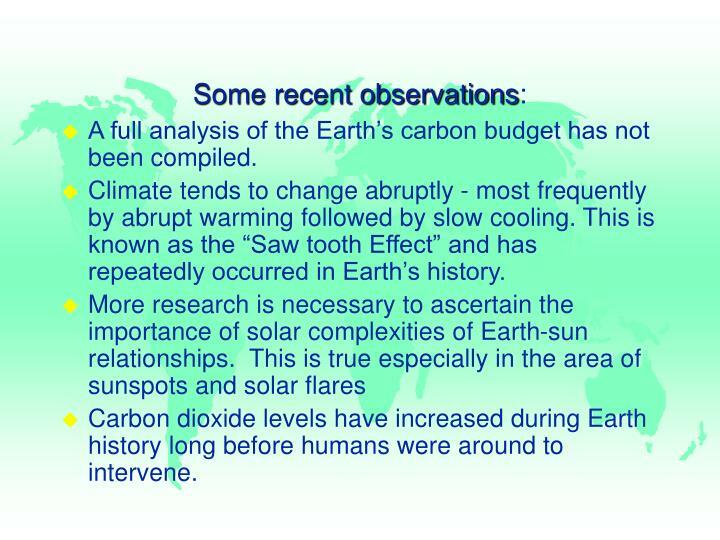 This is known as the “Saw tooth Effect” and has repeatedly occurred in Earth’s history. Carbon dioxide levels have increased during Earth history long before humans were around to intervene. 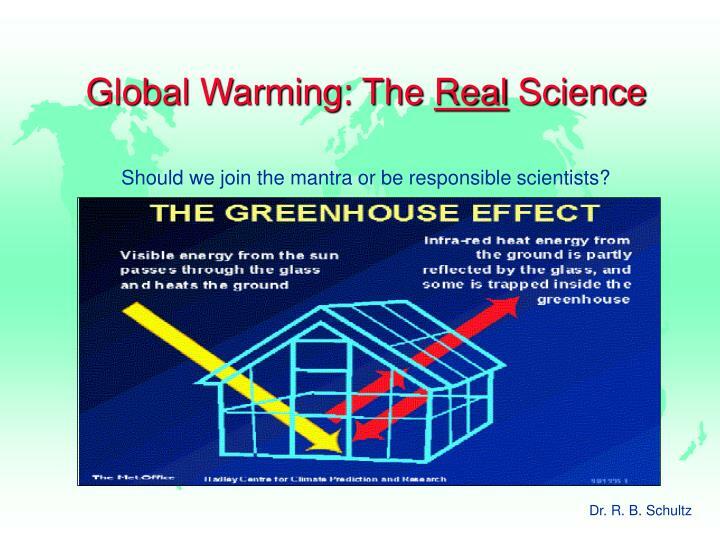 It is important to note that the “Greenhouse Effect” is a natural process that has been occurring for millions of years. We’re not seeing the forest for the trees regarding the global warming issue. Short-term trends advocate worldwide temperature increases. Long-term trends are natural, static, and are indicative of a dynamic planet despite human contributions. Carbon dioxide is actually a poor gas for transfer of heat. In reality, water vapor is the overwhelming force driving heat transfer. Our crystal ball of future climate is dirty. Technology and further study are the only remedies that can clean it. 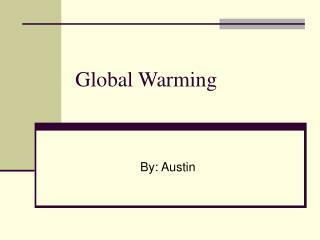 Let’s not jump on the global warming bandwagon too quickly without first being objective and careful scientists. Gerhard, L. C., and Hanson, B M., 2000, Ad hoc committee on global climate issues: annual report; Amer. Assoc. Petrol Geol. Bull., v. 84, no. 4, pp. 466-471. Mahlman, J. D., 1998, Science and nonscience concerning human-caused climate warming: Ann. Rev. Energy Envir., v. 23, pp. 83-105. Michaels, P. J., 2000, Perils up in the air; The Washington Times, April 12, 2000. 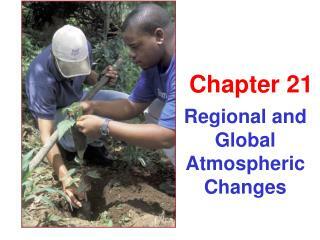 Regional and Global Atmospheric Changes -Chapter 21. regional and global atmospheric changes. global climate change. mean annual global temperature,1960–2003. global warming slideshow. Return to Home Page -. 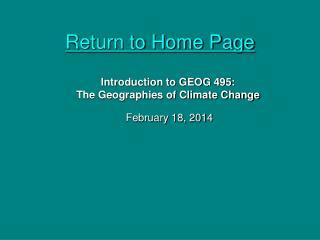 introduction to geog 495: the geographies of climate change. 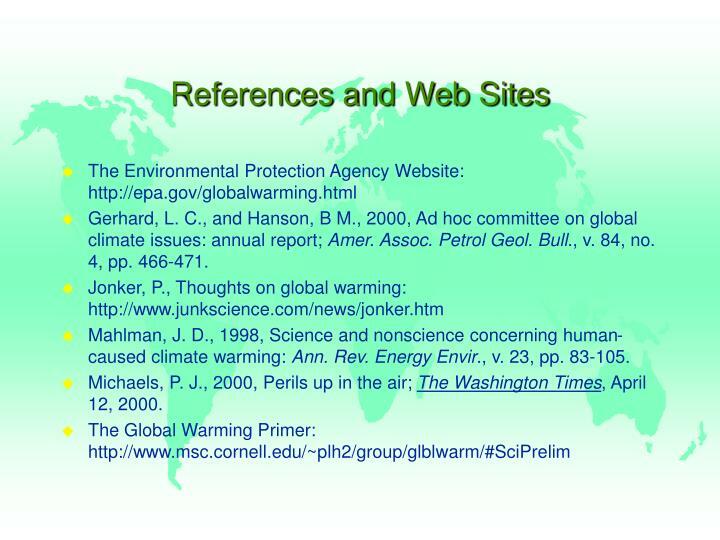 february 18, 2014. source: john houghton, global warming , 4 th edit., 2009, p. 127. websites to use today. Global Warming -. by: austin. what is global warming.